I got smashed quickly by Csati,Oliver in a game that was not really a game at all. After 10..Qc7? (diagram) I thought I was up a P and secure on the d-file but then game the big 11.Bxf7+! and it was pretty well game over. RAC I lost while RAC II won. I contributed an unfortunate loss with white after I gave a P early to Takacs,Kevin. What was more sad was I missed some wins in the complications during the game. I was going for a massage in an exchange Queen’s Gambit, against the isolated QP but was having some trouble with the Bb4 pin. After some tense maneuvering the following position was reached. Now if 30…bxa3 31.Be1! and white keeps the extra piece or 30..Qxa3 31.Be5! and white is winning. The game continued 29.Nxb2 ba?(diagram). Black is hoping to win the knight which seems to be trapped. Now 30.Be1! wins a piece. as 30..Qb5 31.Qxb5 ab 32.Nd3(the knight escapes). I played 30.Be5(trying to set up a mating attack with 31.Bxf6 etc) and attacking the b-pawn and the fight continued. Much later in the game after 50..Qd6(diagram) I again missed a chance to turn the game. I should have played 51.Rb7! (activating the rook with tempo and hitting g7) which wins as black has no reasonable way to defend the g-pawn. I played instead 51.Qf3? hitting the d-pawn immediately and eventually lost. Adam Kozak is the big surprise with a share of the lead at 3/3. Finally I scored my first win to sit at a very modest 1/3. 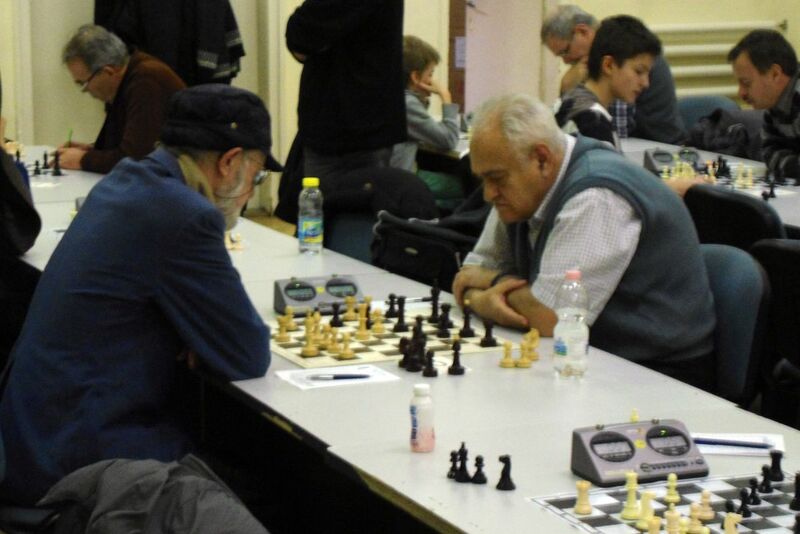 My opponent blundered a center P early and I converted with no trouble. After 27..Qe6(diagram) Black lost all coordination after grabbing the a-pawn and white was able to exploit the stray bishop with a series of forcing moves. The bishop is trapped and white converted the extra piece. Richard Farkas continued his good play beating IM To. A couple of the GMs got clipped for draws to add to the tension too. I lost tragically after playing a decent game. After 28..Bg6 I had a comfortable edge with the bishop pair, better structure and the d-file. After the game I chatted with my teammate FM Laszlo Mihok who came by and showed me his just published book on the middegame(Hungarian language). Of course I bought one on the spot and had it autographed. The opening ceremony featured the normal speeches and the singing of the Hungarian National anthem. GM Portisch was scheduled to sing something but broke his shoulder earlier. The venue is a beautiful building shaped like a whale and today outside on the ground floor was a food/cooking exhibition and craft fair. I lost my rd1 game against a tough opponent in a long battle. After 53..Kg6(diagram) I was quite optimistic after surviving a completely lost middlegame. White is two Ps up(but one is doubled) but black has an advanced passed P that is essentially harmless. I showed some negative endgame brilliance and allowed some counterplay, dropped a P and then a piece for a heartbreaking loss. 94 players are in the top group. Looking forwards to a great tournament starting tomorrow. Rakosligeti had to settle for second place in the 6-board Team Ch after getting a tough loss in the final. Strenner played a fabulous game but just could not find the win and eventually lost. Varga got a crushing attack with white against a Najdorf Sicilian with 6.Bg5. I was was gradually massaged down trying to hold black against 1.Nf3 opening that turned into an English Opening. I lost on board 5 with black with the last game to finish in a long hard game but I was never really in it. I got a usual passive position that was much worse than I thought in the opening. After 40.Qa7(diagram) I just could not hold the position. I should have played 40..Qe8! threatening ..Qe3+ and white cannot take the knight. However white can just retreat the queen and black continues to suffer. I played the more normal 40..Qf7 saving the knight but dropping the b-pawn and there was no amount of wriggling around that could save the game. Both players were down to their last minute(Time control was 90-90) when I made the last blunder and had to resign. The top group has grown to 74 players and is looking a bit more international. Veteran Lakat,Gyula leads the way in the B group. Better watch out as there are some dangerous veteran players in this section. 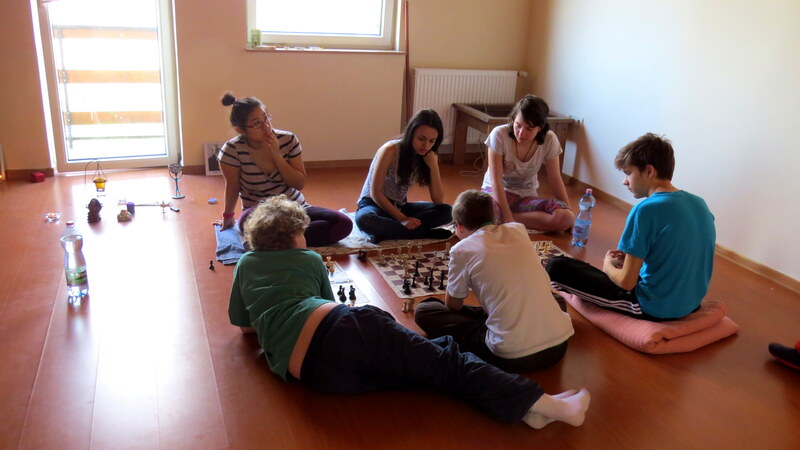 The Tapp Family has come to Budapest for a chess adventure of a lifetime. 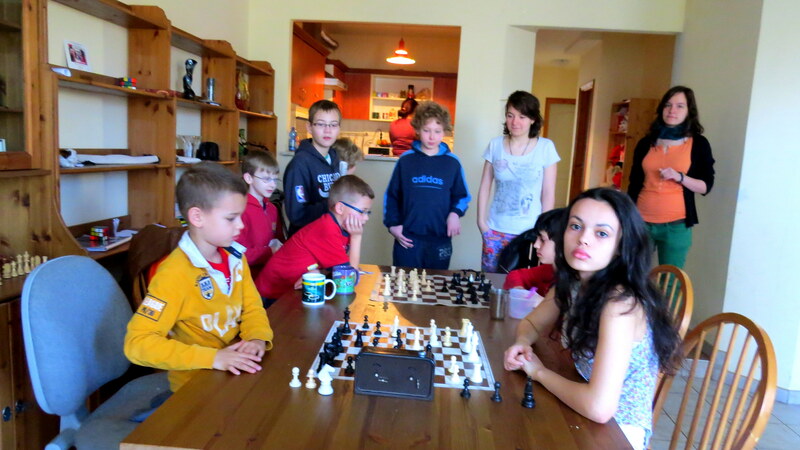 Ashley Tapp will play in the Budapest Spring Festival B Group. 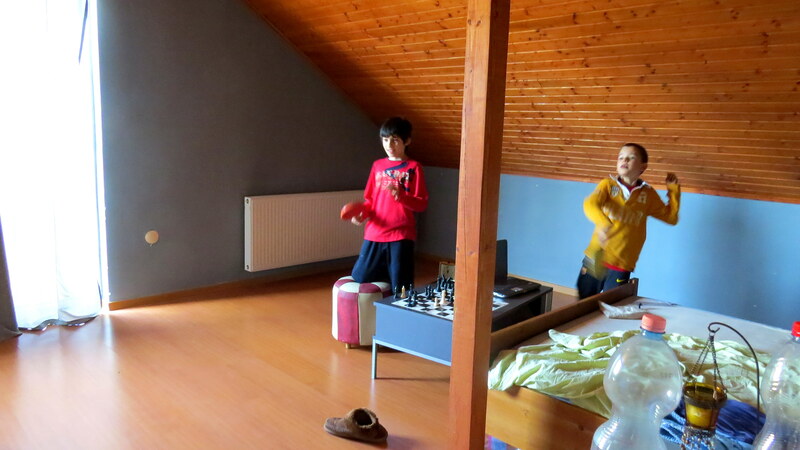 ichessu was the first to introduce Ashley to Budapest. 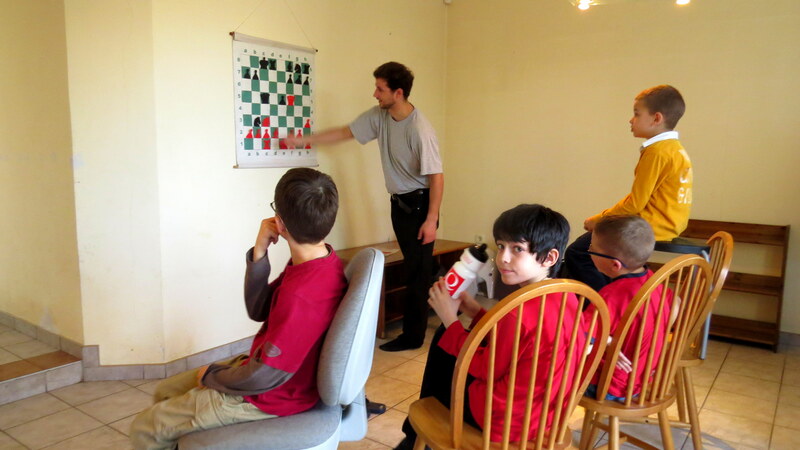 Ashley and Jacob Tapp are getting some Hungarian style chess training at the Polihisztor Studio. A strong field so far is shaping up in the top section, with a mysterious unrated player. WIM Nguyen Thi Mai Hung is living here for training while this is the sixth year of my middle-age apprenticeship. Otherwise there is a noticeable absence of foreign visiting players…so far.